Merry Christmas from Angela Merkel! It's the final day of our SteynOnline sixteenth-birthday celebrations, with sixteen per cent off everything at the Steyn Store. Fill your shopping basket, and we'll apply the sixteen per cent discount at checkout. We also have fifteen per cent off tickets for the first ever Dennis Miller/Mark Steyn tour, if you enter the promo code HOLIDAYS. That's for all four shows - Reading, Syracuse, Wilkes-Barre and Rochester - and also for premium tickets to meet Dennis and me after the show. But please note you have to order before midnight tonight. As a result, she no longer goes out after dark. She had also decided - with reluctance, because she enjoyed it - to cancel her participation in a local Christmas market, where she'd sung carols every year - in broad daylight. 'Why would you do that?' I asked. The steel baskets, called Terrablocks by experts, are part of a pilot project by the Berlin Senate, reported the Berliner Zeitung. The Senate is investing €2.6 million in the new blocking elements, which will later become the property of the police. In addition to the 160 wire baskets, which are connected together and when finished will stand along the side of the Christmas market, 13 heavy steel pedestals will be erected at another part of the square near Hardenbergstraße. Meanwhile, 70 mobile bollards, so-called truck blocks, will be installed at the pedestrian entrances, leaving space for pedestrians - but none for vehicles. The Senate assures that the barriers will be able to withstand a 40-ton truck. What is being tested here could surround Christmas markets in the coming years, the Berliner Zeitung reported. Nothing says Christmas like a ring of Terrablocks able to withstand a 40-ton truck. The locals call it Fort Glühwein, which is somewhat of a tame jest. Perhaps they could remake The Great Escape about a group of anglophone tourists trapped inside a Berlin Christmas market, with Steve McQueen roaring around on his motorbike revving up to see if he can jump the fence. It is not a small loss when ancient community traditions can only take place behind ugly barriers of concrete and steel. What measures will be necessary to enable a Christmas market to proceed in the Germany of 2030? Or will the public communal celebration of Christmas have thrown in the towel by then? ~We must find good news where we can. In a fortnight's time, the leaders of the world will assemble in Morocco to sign the UN's Global Compact for Safe, Orderly and Regular Migration, which, as its title suggests, is intended to make "migration" a human right and oblige the functioning nations of our planet to facilitate and fund it. The idea of "migration" being administered by a transnational body beyond the democratic accountability of supposedly sovereign nations is, of course, obnoxious. Were the logic of this agreement to be followed, it would, in fact, ruin the world. President Trump was the first to tell the UN to take a hike. Israel followed. So too did the EU's awkward squad - Hungary, Poland, the Czech Republic, and Austria. More surprising was Australia's post-Turnbull ministry, which declined to support the compact on the grounds that it failed to distinguish between legal and illegal immigration. That's not a bug but a feature: The purpose of the agreement is to abolish such niceties, because after all, if a nation no longer has jurisdiction over who crosses its borders, how can it possibly presume to determine which crossings are lawful or not? So that's the good news: seven naysayers. It remains nevertheless a fact that the overwhelming majority of developed nations remain willing to sign this thing. Which in itself tells you how fearful their leaders are of countering the multiculti pieties. As I've said for years, government-enforced diversity is where nations go to die. Globally-mandated diversity is intended to make it a fait accompli. Annex 2 Art. 3(4) states that the UK shall be 'informed' of any decision by the EU to amend the Common Customs Tariff 'in sufficient time for it to align itself with that decision'. That's awfully sporting of them, isn't it? On this, the worthless Mrs May and her ministry have spent two years "negotiating"? Was there any other UK official in the room for these "negotiations" other than a competent stenographer? Britain's Remainers, not least at the BBC, profess to fret that Brexit will be a disaster. Au contraire, they, like Brussels, are terrified that it will succeed, and thus encourage les autres. So the "deal" is designed to ensure that it will fail. And, even though it will fail because it is a non-Brexit, that will still enable the Remoaners to say, "We told you so." Both the Remain campaign, and the Leave... campaign should jointly agree that this vote is final, doesn't matter how marginal it is, it's final. Once this is resolved then that's it for a generation. That's what they said last time, but the masses gave the wrong answer. Decent of Tone to give them a second chance. By the way, the Tory bogeyman of the Corbyn Terror is a bit of a damp squib, in my opinion. Nothing Corbyn has in mind would inflict the long-term damage of what Mr Howe calls the "true vassalage" of the UK's new status under the EU's in-out-in-out-shaken-all-about Hokey-Cokey. That's aside from the broader deligitimization of self-government and democratic accountability. But what could be worse than Mrs May's Hokey-Cokey purgatory? Or a worse betrayal of the people? ~We had a busy weekend at SteynOnline starting with my thoughts on a sinister Saudi and a great BBC survivor. Our Saturday movie date considered the new Freddie Mercury biotuner, Bohemian Rhapsody, and our Sunday song selection celebrated an irrepressible pick-me-up, "Zip-A-Dee-Doo-Dah". SteynOnline's marquee presentation was our continuing Tale for Our Time, Baroness Orczy's thrilling adventure set during the French Revolution's Reign of Terror - The Scarlet Pimpernel: Click for Part Fifteen, Part Sixteen and Part Seventeen - or, if you want to start at the very beginning, settle in for a good old binge-listen here. If you were too busy taking dictation from Jean-Claude Juncker all weekend long, I hope you'll want to catch up with one or three of the foregoing as a new week begins. Tales for Our Time is made possible thanks to members of The Mark Steyn Club, for which we are profoundly grateful. You can find more details about the Steyn Club here. And don't forget our special Gift Membership, which makes a fine Christmas present, and this holiday season comes with a special personalized Christmas card from yours truly and a handsomely-engraved gift-boxed USB stick with three of our most popular Tales for Our Time for your pal or relative to listen to in the car or perambulating through the wilderness or almost anywhere else. (The trio of tales is The Strange Case of Dr Jekyll and Mr Hyde, The Time Machine and The Thirty-Nine Steps.) For more on our Christmas Gift Membership, see here. Catch you on the telly with Tucker live across America at 8pm Eastern/5pm Pacific, and just before that for Part Eighteen of The Scarlet Pimpernel. Final Verse "You put your WHOLE SELF IN, you put your WHOLE SELF OUT (repeated twice) THAT'S WHAT IT'S ALL ABOUT" there'll be NO WHOLE SELF OUT! Great Britain sadly is Great No More. The US, Israel, Hungary, Poland, the Czech Republic, and Austria all give the finger to the UN: as Mark says, that *is* good news. (And it's just one shy of a proper "Seven Nation Army". Maybe Italy will join up next). I assume that if the Terrablock pilot program at the Berlin Christmas market is successful the EU will follow up with a full scale installation of Terrablocks around the perimeter of the entire EU. The blocks will be placed sufficiently far apart to allow easy ingress by any hopeful migrant, but will be sufficiently sturdy to prevent any member State leaving the European Union. The Terrorblocks are a reminder of the Las Vegas shooting last year outside the Mandalay Bay. The fencing trapped people, leaving them nowhere to go and allowed the shooter to concentrate his aim in a small area, maximizing casualties. One man's security fence is another imam's fish barrel. 'One man's security fence ...' v.v. good (and an excellent point), worthy of our host. In far off 2012 my daughter and her new American husband chose The Smiths 'There Is A Light That Never Goes Out' ('And if a ten ton truck, Kills the both of us') for their first dance. We laughed under the baleful glance of a full-length portrait of Edward Heath in HAC uniform. It all seems much less amusing now as I think about my grandchildren's prospects as conscripts in the Euro army on the Russian border. 50 years ago my father told us that his sector of the BAOR/NATO front reckoned on holding CCCP for four days to allow negotiations. The next step was to use nuclear weapons. The Russians are weaker now of course but given that the EU would probably have picked a fight with USA too the prospects don't look good. Sol, that is an excellent point about the fish barrel. Mark has made similar observations about airport "security perimeters". That is quite a scene you've drawn: "And if a ten-foot truck kills the both of us..." fits this situation eerily now. At least Morrissey has landed on the right side. There is a permanent memorial at Breitscheidplatz, with an ironic (designed) crack running through it to represent the cultural divide (victim-blaming), for the 12 dead and 56 injured in Christmas 2016 by a Tunisian in a 32-ton truck. After laughing at "the baleful glance of a full-length portrait of Edward Heath" it is a sobering future. It would seem that the established Conservative and Labour parties prefer vassalage under the EU, on the theory that they will remain the established parties. What happened to last year's concrete Merkel Lego blocks in Christmas wrapping? An excellent example of the well known German dry sense of humo(u)r. There was a rumo(u)r that they were useless but when did that ever matter? "Remember that when Satan offered Blair support over stopping Brexit in return for his immortal soul, Blair asked: What's the catch?" You had me howling this morning Kate. O'Sullivan is awesome. So wish I could have made it to the inaugural cruise or even to the next one, but the timing excludes me. If Mark is still cruising when I eventually retire, I'm in! PK, the MSC Cruise will no doubt be a biannual event by 2020 (option of springtime! ), such is the demand. That would be great Kate, as long as the spring date isn't during the seeding/planting season where I am needed on the farm as well. I never expected I would be helping on my spouse's family's farm when we got together as they had a full complement of family members already working, perhaps even one extra. Then one retired and one quit in a huff, leaving everyone in the lurch right before harvest so I got my commercial truck driver license, took some vacation time from my career job as an IT manager and stepped in to help. It went so well that I am now expected, no relied upon to be a farm hand twice yearly as well as for some tasks in between. It's been five years now. The family has farmed for exactly 100 years, this summer and we celebrated our 10th wedding anniversary this summer too. I am married into the farm now, like it or not and it is a toss up on any given day. This year my brother suggested I "just go" and join the inaugural cruise. A week with Steyn at Sea and MS Club members was very enticing and ever will be, but I prefer to stay married as that should have much more benefits on a personal level, for the long-term. Having witnessed the challenges of losing a vital crew member from the farm in the past, I could not do that for my own personal pleasure. A word that has been "disappeared" from our vocabulary is sovereignty. It is no longer possible for a country to determine its own course. Continuing with vocabulary, I wonder what is the difference between a TerraBlock and a gabion? In Afghanistan we use Hescos to protect forward operating bases. I imagine two of them are trade names for gabions, wire or cloth bags filled with earth or rocks. The real question is what happens when a 41-ton truck equipped with a snow plow shows up? Or a couple of guys/gals walking in with suicide vests made to look like puffer jackets. The only good news is that parliament debated May's deal for an hour before any MP expressed any support for it. It seems the Remainers may have overplayed their hand and signed up to a deal that won't be ratified. No doubt Gareth, but what happens next if it isn't ratified? When things quickly go south which side will shoulder the blame? One doesn't need to bring in Carnac the Magnificent to answer that one. One other point receiving little media attention - if it somehow does pass how does England possibly control incoming Islamic immigration if the Irish border remains open? Just wondering. 21st cc. dystopian nightmare: "Always Christmas, but never winter". BB-i-PEI -- thanks for the reminder to read "The Chronicles of Narnia" again over the holidays. Great comment, but winter is coming, notwithstanding the global warming alarmists' claims. The White Witches and their dwarf minions will see to that. For Narnia, don't forget that Aslan's very presence caused extreme climate change in a few hours (LWW). Most people seemed to think it was a good thing. If CSL had lived another fifty years he could have rewritten LWW with all the "ghouls, boggles, ogres, minotaurs, etc., " as Greens. And he also coined the phrase "green as poison." Love CSL. Great reminder to load up some Audible audiobooks for my eight-hour drive, one way, to visit Mom and sibs after Christmas this December. I always remember the words, but who remembers who said them on Chris Matthews' show when McCain/Palin were on the ticket? Referring to C.S. Lewis as Palin mentioned his work among her favourites, the interviewee (it was a woman) said, "Didn't he write children's books?" Chris Matthews responded, "Don't go there." It was apparent Matthews was aware of CSL's work while the woman was oblivious and probably was thinking of the video version of "Chronicles of Narnia", promoted for children. 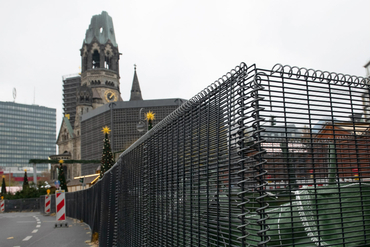 The picture of the fenced-in Christmas market in Berlin reminded me of German fences past, and I got a bit of a chill. Then I remembered that those fences were to keep people IN. Germany has no experience, and seemingly little interest, in keeping people OUT. "Perhaps they could remake The Great Escape about a group of anglophone tourists trapped inside a Berlin Christmas market..."
Or maybe a remake of "The Dam Busters" (Bollard Busters?) with squadrons of the jetpacked, IED-ladened Mohammedans descending on German Christmas markets. Yes Josh - this does resonate for those of us whom still remember the Berlin Wall. What is amusing with some on the left is when pretending to be obtuse they equate a border wall with an imprisonment wall - both evil of course in their mind. Then again, perhaps they're not pretending at all. Rush was talking yesterday about the inexplicable belief that humans will someday live on Mars and said that with superhero movies being so dominant, maybe that is a clue as to why so many people think it's possible. A Muslim superhero movie would be a fascinating way to tell the story: How is it going to work out after Merkel has said, "Islam belongs to Germany" and Islam has applied the commutative property: Germany belongs to Islam? Couldn't May take a lesson from the negotiating tactics from the final scenes of "Spies Like US"??? Obviously Aykroyd and Chase were better at it than she. Modern Europe's cities are looking more like concentration camps then vibrant open cities. Orwell has turned out to be an optimist and Air Strip One is looking more likely everyday. I was looking at the forecast of the British Pound. For those wishing to buy some bespoke item from the UK before craftmanship fades, take heart as the exchange rate is supposed to go south in a big way... but timing is everything. From imperial hope and glory to historical theme park, the final transition to the outer frontier of the EU that will be Britain is on the horizon. Typical of "democracy" as practiced by the EU (and all popular sovereignty phobic regimes): Keep voting until you get the answer best for the central planners then declare voting closed. Mark, I'm dying...."the EU's awkward squad - Hungary, Poland, the Czech Republic, and Austria". Can we call them the P.H.A.C EU countries????? Excellent, Laura. Though perhaps the Sausage Elders would be more diplomatic. Josh, what is this word you speak of, "diplomatic"? Hilarious, Laura! Reminded of one of your anagrams just yesterday (HOTS/HOST)... where were you? Just add Slovakia and you can call them "the chaps" -- C.H.A.P.S. of the EU. Laura, More than excellent. Whatever that word would be. Hots for host? I certainly resemble that remark! Brilliant, Laura! Now alll I want for Christmas next year is my PHAC EU Christmas tour! LOL thanks for the walk down memory lane. When people ask me where i'm going for Christmas each year, I usually say, "oh, just hanging at home with the dogs, like every year." Next year when they ask me, I can say with glee, " PHAK EU"! I can see it now, The Protocols of the Elders of Sausage. Getting off-topic (there's a topic? ), but: Three things one does not want to witness the manufacture of: sausage, legislation, brokered "peace" deals with Arab death-cultists. Actually, I can handle sausage. The other two make me wanna hurl. Growing up, my uncle always told me that hot dogs were made from "lips and assholes". Sausage-making isn't so bad, it's rather artful when done well. You probably don't want to see head cheese made though. I have seen the recipe in a handed-down family cookbook. The pioneers were resourceful, nothing was wasted.